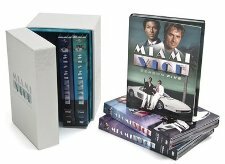 Today’s deal at Woot.com is the The Complete Series Box Set of Miami Vice. Go undercover with James ‘Sonny’ Crockett (Don Johnson) and Ricardo Tubbs (Philip Michael Thomas), two of the Vice Department’s coolest cops, as they take on the bad guys in Miami’s steamy underworld. Plus, these guys drive the coolest cars around in the 80’s! Notable musicians appearing in the series include Sheena Easton, Willie Nelson, Gene Simmons, Ted Nugent, Glenn Frey, Frank Zappa, Phil Collins, Miles Davis, Frankie Valli, Little Richard, James Brown, Leonard Cohen, Isaac Hayes, Jan Hammer, Power Station, The Fat Boys and Eartha Kitt. Guest appearances by Jimmy Smits, Ving Rhames, Liam Neeson, Lou Diamond Phillips, Bruce Willis, Ed O’Neill, Julia Roberts, Dean Stockwell, Pam Grier, Brian Dennehy, Dennis Farina, Stanley Tucci, Bill Paxton, Luis Guzmán, Kyra Sedgwick, Esai Morales, Wesley Snipes, John Turturro, Melanie Griffith, Michael Madsen, Nathan Lane, Laurence Fishburne, Ron Perlman, Lee Iacocca, Steve Buscemi, Don King, Vincent D’Onofrio, Annette Bening, Viggo Mortensen, John Leguizamo, Ben Stiller, Chris Rock, George Takei, Tommy Chong, Benicio del Toro, Richard Belzer, Penn Jillette, Randall “Tex” Cobb to name a few. You can learn more and buy the box set today at Woot.com.